Audisee® eBooks with Audio combine professional narration and text highlighting to engage reluctant readers! In 2015, when Ohio State took on the University of Oregon in the first College Football Playoff championship game, millions of sports fans tuned in. But back in 1869, when Rutgers University and Princeton University played the first-ever college football game, no one predicted the national spectacle that a college football championship game would become. Author Matt Doeden takes readers on a journey from the disorganized games of the early years to the most recent playoffs to determine the best college team in the nation. 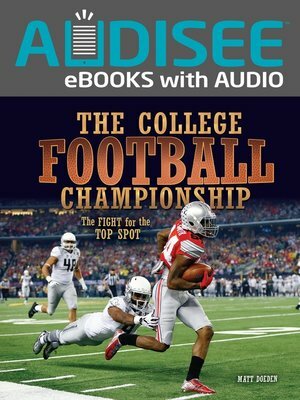 Along the way, discover some of the most incredible moments, games, blunders, and statistics in the history of college football championships.